There's a lot wrong with food trucks these days--not the original loncheras--no, those are doing just fine, but the fancy ones with generators that sound like jet engines and flat screen liquid crystal displays that serve the same purpose as a Xeroxed piece of paper or a scrawled message on a wipe board. Of course as with any trend there are real gems among the boom of the overpriced and over-hyped "street food" "movement", which of course was a "movement" without having to be called one well before it got trendy and expensive--and then there are the rest. 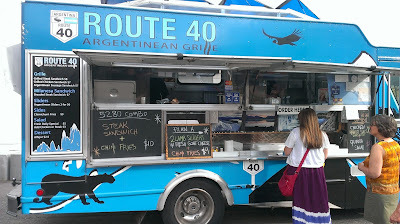 I came across a sampling of food trucks at this year's Denver County Fair, and the silliness of the food truck boom was plain to see upon walking into the Stock Show Fairgrounds. 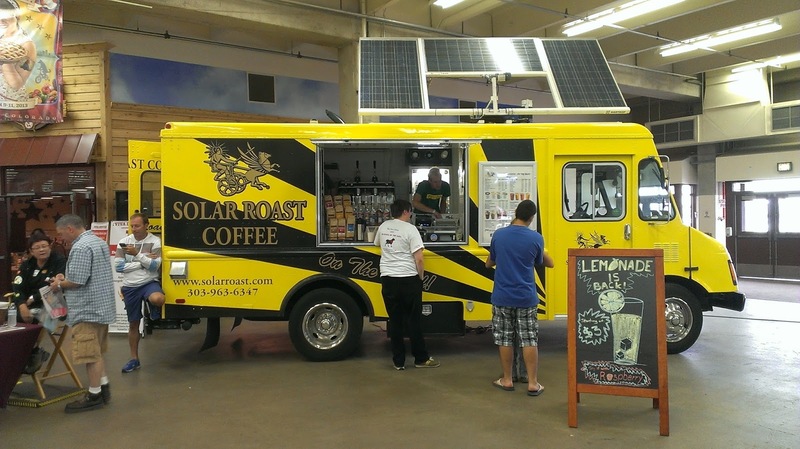 In case you can't tell by my photo, that is a solar powered (that means powered by the sun--trust me I Googled it) food truck inside (where the sun's rays do not penetrate--looked that up too, it's solid fact). 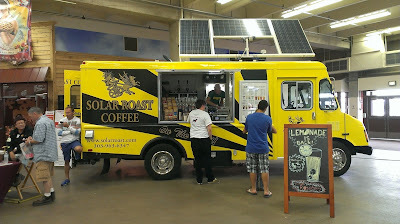 Although I realize that there are probably ways to store energy from solar panels and use them at a later time (and I have never tried their coffee brewed using the force of the sun so I can't comment on the quality), I thought this simple shot summarized the food truck trend perfectly. 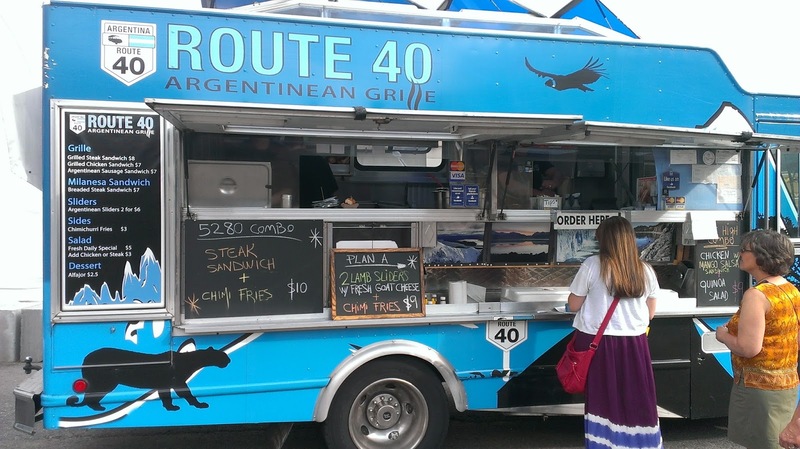 Moving on to the outdoor food trucks, our eyes and stomachs were drawn to the well designed and not-too-flashy Route 40 food truck and its promise of good Argentinean food. The service was quick and friendly, the menu simple: mostly sandwiches and fries. 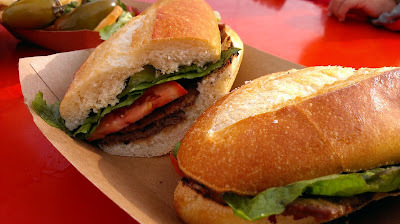 We got a milanesa and a pair of lamb sliders. 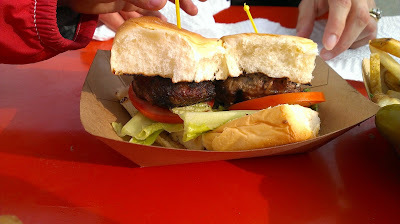 The sliders were good, though they lacked something very important: flavor. The goat cheese provided a nice balance with the lamb, which was not overcooked, but nothing else really stood out or accented either. OK, but could have been great. The milanesa was flavored even less, and the thick bread, though nicely buttered and lightly grilled, took away any chance of tasting the thin meat strips inside. The main flavor was from the fresh tomato and greens. Not bad, but crunchy veggies is not what I have in mind when I think of steak sandwich. The fries came with chimichurri, which was a good idea, but the chimichurri was not chopped very fine: the coarsely cut parsley was hard to keep on the fries and the oil separated out to pool on the bottom. While I am not opposed to dipping fries in olive oil, it is a little excessive, even for me. I've spent what is probably an undue amount of blog space poking fun at Denver's mobile food scene, and I like to think I go into each new food truck experience with a relatively open mind. I really was prepared to like Route 40 for being so relatively simple and unpretentious, and I think the concept is perfect for a food truck. The price was fine too. I hope I was there on an off night, because with a little tweaking they could really be great. Food trucks are the future of the food industry! I live in Utah and they're becoming more and more popular - Crepe trucks, Waffle Trucks, and Filipino Food Trucks are just a few of the most recent I've seen. I'm interested if it's just a fad or if these trucks will continue to thrive. I don't think you went on on off day, I chose the same food truck at the fair and had a similar impression. Although I thought $9 was too much for two tiny sliders and a small amount of fries.